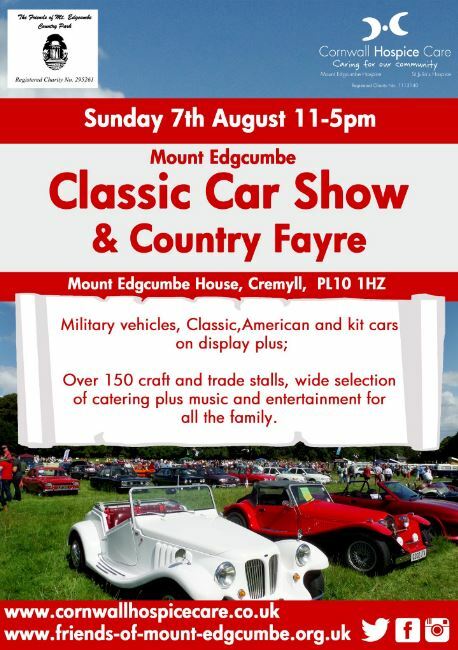 The 20th annual Classic Car Show and Country Fayre will take place on Sunday 7 August at Mount Edgcumbe Country Park. 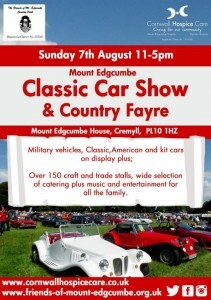 Classic, American and kit cars will be on show along with military vehicles. Car Show Exhibitors are once again are cordially invited to bring your classic, American and kit cars, motorcycles and military vehicles to this event. The (non-refundable) entry fee is £5 per vehicle, including motorcycles, payable in advance. Entry is by ticket only. Car Show Secretary, Mount Edgcumbe House, Cremyll, Torpoint, Cornwall, PL10 1HZ. There will be a large number of trophies to be won and a certificate of attendance will be available for collection from the information tent. The Earl of Mount Edgcumbe will open the event at 11am but entrants can arrive from 8am to find their position – it is recommended that entrants arrive as early as possible.